Nope, I'm not offering any! LOL! That is the name of the website Steff chose for the Inspiration Challenge on SCS today (actually it's Room Service Home). She always chooses the greatest inspirations and this one is no different! After looking at the entire website, I actually came up with three of my own to choose from. I settled on this one from the bath accessories category because of the background...look at it! I just got my Papertrey Ink order the other day and one of the stamp sets I purchased was Background Basics: Retro. I immediately recognized the background in the picture as one of the stamps from the set, so I had to go with this one! Here's the picture I chose. It was a dead ringer for PTI's Aqua Mist cardstock and SU's Close to Cocoa ink. That's where my colors came from. I looked at the flower vase and immediately thought of this vase of flowers from SU's Bloomin' Beautiful. Couldn't be more perfect! I wanted to keep the stainless feel to the card, so I colored the vase with a Creative Memories silver marker I've had forever. It was even dried up and I had to really shake it to wake it up! I wanted to keep the flowers white, but had a hard time with that, so I used copic markers in different shades of the "E" line. I started with the lightest one and worked my way up for shading. I then took a white gel pen and inked up the centers of the flowers. I also popped up four of the flowers. I think if you click on the picture you'll be able to see that better. When all that was done, the flowers still looked dull. So I pulled out my Shimmerz paint and painted the leaves in celery and the shading on the flowers in sunflower. Still not enough, so out came the Sakura clear glittery pen and that livened things up! I wasn't sure what to do with the layout, but I knew I didn't want to clutter up the background seeing as that was my inspiration. So, in keeping with the shiny stainless feel, I went for a silver ribbon. What do you think about that? I was a little hesitant, but I think it looks fine. I went with a little sentiment from PTI's Mixed Messages. On the inside I stamped the background stamp again in Close to Cocoa. The sentiment is from Crafty Secrets Sweet Kids and it's stamped in the same ink. 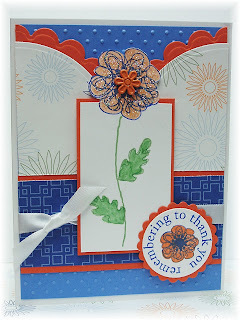 I also used a small leaf from the set and stamped it inside the opening of the background in Aqua Mist. I'm sending this to my Aunt Vi who will be 89 on Monday. She's currently in a nursing home and my mom is ordering flowers to be sent to her. She'll love it, I'm sure! On another note, I can't wait to see what Joanne (aka sleepyinseattle on SCS) chooses as her inspiration today. For the past three weeks, we have chosen the same inspiration! And there have been many pieces to choose from! I haven't looked yet, but she's in Seattle so she's a bit behind me in hours and she is probably just waking up and having her coffee! Well, thanks for looking today and have a great weekend! I was chosen to be on the Copics Colour Challenge Design Team! Can you see me grinning from ear to ear? : ) I just found out last night and am over the moon! This is a new blog challenge that will have weekly challenges on Wednesdays. They just posted their second challenge yesterday. I hope you can play each week! Watch for my samples! Please stop by the Copics Colour Challenge and check it out! I stumbled upon a new blog when I was surfing a couple of weeks back and it's a copic color challenge blog. I love to color with copic markers and thought this blog was so interesting. It's called the Copics Colour Challenge, and they'll be posting copic color challenges weekly on Wednesdays! If you love to color with your copics, hop on over and check it out! Today is their second color challenge and the colors they chose are: B02 Robin's Egg Blue, R05 Salmon Red, and YG23 New Leaf. These colors paired up nicely with SU's Green Galore, Tempting Turquoise, and Ruby Red. I started with this week's Mojo Monday sketch. As I was pulling all these layers together, I wasn't sure how I was going to make this work, but when it was all finished I really liked it! 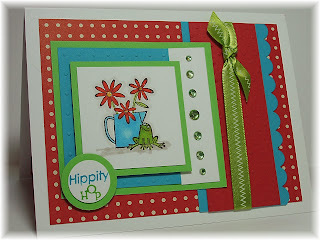 I colored the watering can with the B02 marker, the frog with YG23 and the flowers with the R05. I did add a couple of other shades of the green and blue to get some shading. The centers were also colored with a copic, but then I added yellow stickles because I LOVE bling! I even added bling instead of brads! The vertical ruby red piece and the turquoise layer under the image were run through the swiss dots folder. The dp is from SU's retired Ginger Blossom, and the ribbon is a $1 find from AC Moore. The sentiment on the outside is from PTI's Pond Life. I thought that sentiment sounded like "Hippity Hop...Get Well", so that's the sentiment I went for on the inside with another piece of the dp. Another one done and it's time for bed! Don't forget to try out this new challenge! It's a different spin on the color challenges! Thanks for stopping by! I got some new stamps from Paper Makeup Stamps yesterday, and I had some time to pull another one together. This one used Taylor's Cupcake Sketch Challenge. The layout was perfect for this stamp. I started with trying to find some paper that had a tree of some sort on it (because of the sentiment), but no such luck. So I went with the Basic Grey Ambrosia paper. This pack has to be my favorite of them all so far. I just love the colors in the papers. This butterfly one is especially pretty. I cut two strips of it and then one in the off-white that comes in the back of the pack. I stamped the branch (my "tree") from PTI's Out on a Limb in Adirondack Espresso right on this paper. To do the leaves, I first colored them with a More Mustard marker, then "thumped" Really Rust and Garden Green over it. 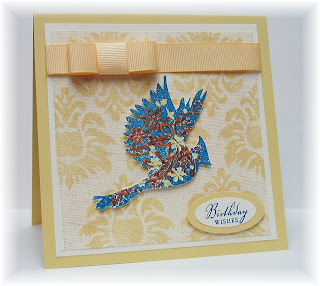 Gina K just did a tutorial on this on her first Stamp TV segment, but I've done this a few times before. It gives a nice mottled look. The sentiment is stamped in Espresso on the same off-white paper as the branch. I cut and embossed it with an oval nestie and sponged Sahara Sand on it while it was still in the die. I wanted it to match the "dirtied up" look of the off-white paper. It was mounted on another piece from the pack, a sort of orangey-red, that was cut and embossed in a scalloped oval nestie. The ribbon is a jute ribbon I got at JoAnn's eons ago. Once it was done, I felt it needed something. So I cut out two butterflies from another piece of the dp and layered them on with dimensionals. I then put diamond stickles on them and the leaves to sparkle it up. I love sparkle! 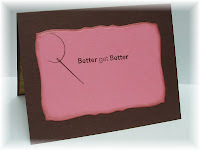 Here' a closeup of the card so you can see the dimension. You can see the red one pretty clearly in the foreground, and there's a blue one on the other side near the sentiment. As I'm sitting here typing this, I'm looking at the card and wished I'd cut out another butterfly and added it onto the sentiment! Oh well, hindsight and all! For the inside of this card, I cut and embossed another piece of the off-white paper and the orangey-red paper with the Labels Two die. The sentiment is also from PTI's Out on a Limb. I thought it went nicely with the outside sentiment. I punched a butterfly from the paper and layered in on. 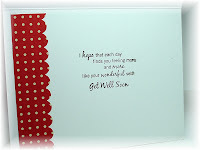 I also took the largest Labels Two die and embossed the inside of the card so that the sentiment could lay inside of it. That's it for this card. Simple card, long post, huh? Sorry about that and thanks for sticking with me! Stop by again soon! I just got my order from Paper Makeup Stamps today, and I had to ink one of them up! PMS is a fairly new company with really cute stamps! I love the fairy stamps. There are four out and I think four more which I've ordered on a preorder sale. I love coloring with my copic markers, and these are perfect for them! This is Chelly with her clover, so I made a St. Patty's Day card with her. The sketch is from PMS and it is their first one. I was going to use another sketch, then saw this one and it was so much better for this stamp. I started by pulling out all the green dp I had in my stash and came up with these two (both retired SU). The top one is from Bali Breeze and the bottom is from Brocade Background. I thought they should have some separation, so I used Vintage Cream and punched it with a Martha Stewart scallop border punch. Chelly was stamped on Vintage Cream with Adirondack black. I used about 15 different copic markers on this! I was even surprised by how many I put back into the container! I added glitter to her wings, the clover, her clothing and even her hair. She sparkles like a fairy should! The ribbon is actually a Christmas ribbon from AC Moore and is gold but looks green with these papers. 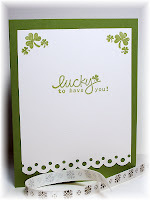 The sentiment (inside and out and the shamrocks inside) are all those $1 Studio G stamps I got at AC Moore last year. (I really like the inside..."lucky to have you!" I'll save this for Kevin. He's mostly Italian, but a small part of him is Irish, and of course he's all Irish on St. Patty's Day!) 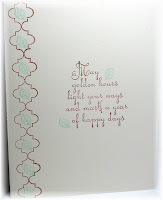 I used a circle punch on the outside sentiment and layered it on the label punch (which is Old Olive). The shamrock bling is from JoAnn's and the butterfly bling is from Michael's (all purchased last year). It looks to me like the clover she is holding is a butterfly net and she's running after the butterfly! I'm really pleased with this card, considering I almost scrapped her because I didn't like the way she was looking as I was coloring her! But if you keep on coloring, you usually get a good result! What do you think? I have no business making a card when I have some papers to correct! Yikes! Thanks for stopping by! This is going to be a short post because I have to go back to work tomorrow (let's have a pity party for me now! ), and it's already after 9:30! I'm sending this to my girlfriend, Eileen, who purchased tickets for myself and my other friend, Maria, for a fundraiser for the zoo called Polar Bites. It was lots of fun, only Eileen couldn't go because she had to work later than expected. Maria and I kept forgetting to pay her for the tickets, so I thought this card would be appropriate. An elephant saying "Aww...nuts! I can't believe I forgot!" Perfect, huh? Don't you just love when you have the perfect stamp for a certain situation? That's what happens when you have every possible stamp imaginable! Anyway, Ellie is stamped on PTI white in Adirondack black and colored with copic markers. The dp is PTI's Polka Dot Parade and it paired nicely with pumpkin pie and mellow moss. I added candy dots (not the real candy ones!) in the corners and pierced the corners of the pumpkin pie paper. That's it! I hope you have a good week. I don't know how much posting I'll be doing this week now that I'm back to the old grind! Stop by again and TFL! Hi everyone! 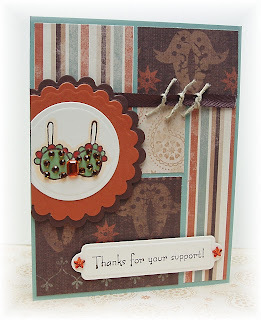 This card was made for the SCS Inspiration Challenge (one of my favs next to the sketch challenges!). The website chosen as the inspiration is called Flutter and I chose this Sweet Blue Bird pillow as my inspiration. It's a pretty literal translation, isn't it? 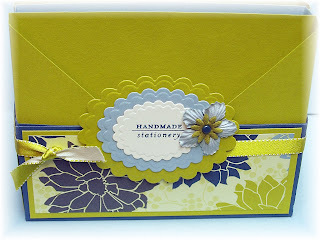 I started by stamping the damask from Inkadinkadoo's Bold Damask in So Saffron on Very Vanilla. I then overstamped it with the Canvas bg stamp in Creamy Caramel to get some texture like the pillow. Now the bird gave me trouble! It's also from a set by Inkadinkadoo called Winter Birds. I stamped it in Pacific Point, but since this stamp has so much surface area and is an acrylic stamp, it stamped very "splotchy". Does anyone know how to prevent this from happening? I stamped it about six times with the same results. Ugghh! After I stamped it, I colored in the flowers and stems with So Saffron and Really Rust markers. The bird in the inspiration had some of these colors in him as well. I tried to do something to mimic the sort of rope border around the pillow, but was hurrying, so I used SU's Sale-a-bration ribbon and made a formal bow. The sentiment is from PTI's Out on a Limb stamped in Pacific Point and punched with the large and small ovals. Done! I forgot to put some stickles on the bird. I wanted to do that to give him some pizazz, but forgot. He'll get them later! Thanks for stopping by and have a great weekend! I've been saving this post for when I have nothing else to share! I've been very lazy today...I had a headache this morning and just lazed around watching TV and stopping by SCS and some blogs. That's it! Sometimes it's nice to have nothing to do. 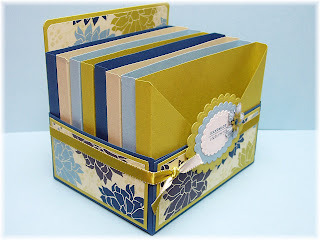 I saw a video by Lauren Meader recently where she made this Birthday Box (as she called it). She made it with her My Timeless Template called All Boxed Up. You can see the video here. She gives all the details you'd need, so I won't go into that. I've always loved this Urban Garden dp by SU, so I decided to use it for this project. The other colors I used were Kiwi Kiss, Baja Breeze, Sahara Sand, and Night of Navy. Aren't they gorgeous together? 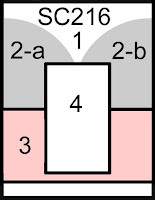 You need eight of the boxes from the template. You can find it here at Papertrey Ink. You are able to print the templates right onto your cardstock, however my printer wouldn't allow me to do that, so I just printed eight of the templates on regular copy paper and attached it to the cardstock with removable tape and cut and scored away! Very easy to do! For the front, I cut and embossed three different sized ovals. On the smallest one, in vintage cream, I stamped "Handmade Stationery" from PTI's Simply Stationery set. I added a couple of flowers and a brad and some Kiwi Kiss satin ribbon. 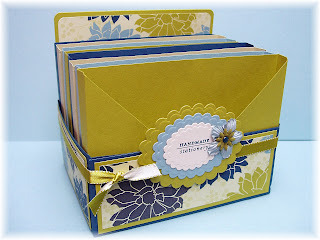 On Lauren's box, she punched tabs using the rounded tab punch and put two months on each tab. She was intending it to be used as a box to put birthday cards in for each month. I'm not sure what I'm using mine as. 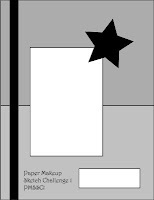 I was thinking of organizing it by type of card (birthday, sympathy, etc.) or even to hold some RAK images or ones I've colored but haven't used yet. I'm still thinking about it! So many options for it! On another note, Bev from All the Things I Love is giving away two awesome blog candy packages! You should hop on over and check it out! Pretty awesome stuff! That's it for today folks! I'm off to a fundraiser this evening for our Buffalo Zoo. It's called Polar Bites! Should be fun! See you again soon! ...to be kind when making comments on this one! LOL! I had a tough time with this flower! It went through a couple of stages before this final version! 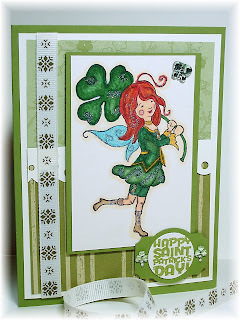 This card combines two challenges...the Sketch Challenge on SCS today and the Color Throwdown Challenge. 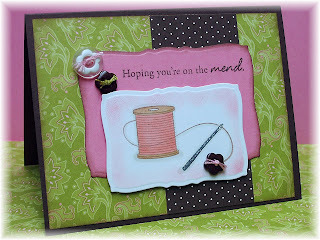 Love the sketch and the colors and I think I'm starting to like this card (remember...be kind!). The colors for the CTD challenge are tangerine tango, brilliant blue and ballet blue. I found these colors in SU's retired Jersey Shore paper. The swiss dot mat is the ballet blue. I stamped the flower from PTI's Remember, using the solid stamp, in the tangerine, then off-loaded some of the color before I stamped it again. It just seemed too dark when stamped in the full color. The detail stamp was done in brilliant blue. The stem and leaf outline are wild wasabi. I don't know if you can tell, but I painted the inside of the leaves with Shimmerz paint in celery. I was wishing I had an orange for the flower, but since I didn't, I glittered it up. I used the out-of-the-box technique for the flower, too. I had never done this before, but was eager to try it. I like the way this came out. For the quarter circles I cut and embossed both the dp and the scallop in the largest die. Then I cut it in half, then I cut it almost in half again so that it measured 2.5". The rest is pretty self-explanatory. Please let me know what you really think...I'd appreciate that! Have a great day and thanks for stopping by! See another card using this sketch below! So here's another card made with the SCS sketch. 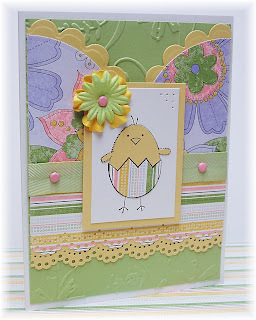 I used SU's A Good Egg as my main image and paper pieced both the egg and the chick. The egg was paper pieced with Tea Party dp and the chick with so saffron. 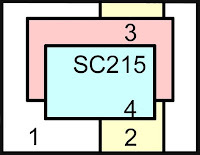 Tip: When I paper piece small pieces like this, I run them through my Xyron machine. This way, the entire piece is covered with adhesive and they lay on the base much better. This is much easier than trying to get little bits of tap on the back of them. 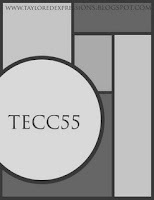 I used the Tea Party dp again for the circles and the horizontal piece and layered them over so saffron. The horizontal pieces were given a nice lacey effect with the Martha Stewart lace edge border punch. The certainly celery mat was run through the stylized flower folder. I placed a piece of certainly celery twill ribbon (from the Sale-a-bration ribbon bundle) under the main image and placed pink brads on either side of it. Lastly, I added a yellow and green prima to the main image, secured it with another pink brad, and pierced the opposite corner (it looked too bare). I have all this layered onto a base of PTI white cardstock. That's it! Another one done! I love being on vacation! Thanks again for stopping by! 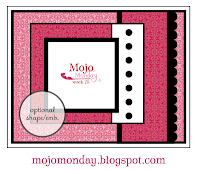 This week's Mojo Monday sketch is a real pretty one (Julee's sketches are always fabulous!). I started with this Sweet Always dp. It combines a weird color combo that really works nicely...regal rose, pumpkin pie, pink pirouette and then some chocolate chip thrown in. 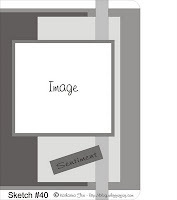 For the image I used Botanical Blooms, one of SU's sale-a-bration sets. 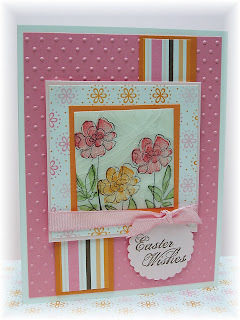 I used to stamp-a-ma-jig to get the placement of the flowers and leaves just right. I used the cracked glass technique just for something different and because I've never done it before. I purchased the glassy glaze a while ago and just never used it. Pretty easy technique and you get a cool look. I inked up the image with Versamark between each layer. I tried it when it was still hot and it didn't stick very well. I also did not put ink over it to age it. I tried that and didn't like the look for this particular card. You should give it a try sometime. It's a fun technique! Thanks for stopping by! Well, I'm back with another sketch challenge! This time it's one of Jen del Muro's Sketch for You to Try (SFYTT). I just received this new SU paper called Parisian Breeze. The patterns are printed on textured cardstock, so it's much like regular cardstock. They have four different sets of this type of designer paper, and this one is fabulous! I just love the colors in it. I started with a PTI white base and used three different patterns in this pack. I paired it with sahara sand. 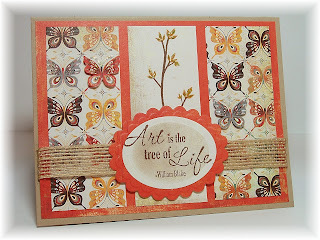 The Tilda image is an RAK from my stamping buddy, Cheryl Rowley (thanks Cheryl!). She's a pro at coloring these Tildas, and mine isn't anywhere near her creations! I used copic markers to color her. Chosing the dp and coloring the image were a snap. What took forever was trying to decide what to use for embellishments! None of the flowers I had matched the colors I was using, some embellishments were too big, etc. So I decided to take these flowers, which were originally white, and color them with the darker copic marker. I've colored brads before to match, but never flowers. They came out darker than I thought they would, but they looked nice anyway! I placed a pearl in the center of each one. What do you think...are they too dark? Have a great day and thanks for stopping in! Did you ever forget someone's birthday? I do that all the time! I'm hoping to get more organized so that doesn't happen. I made a birthday box (a la Lauren Meader), which I'll share another time, that will hopefully help with that. 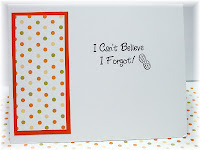 But I purchased this stamp set from High Hopes a while ago just in case I did forget someone's birthday. She's Ellie, and isn't she cute? I just love that ribbon tied around her nose! I didn't decorate the inside yet, but there is a sentiment that goes along with it that says "I can't believe I forgot!" Cute! I started this card with a sketch from High Hopes. I knew I wanted to color him with gray copics, so I looked in my stash for paper with gray in it. This dp is from Basic Grey's Ambrosia line. I love the stripes in this. The orange color paired nicely with SU's pumpkin pie and basic gray. After coloring Ellie, I ran a piece of pumpkin pie through this cuttlebug folder I just purchased. I layered all the pieces and paper pierced a line of holes along the right side of the gray piece. The ribbon is SU's taffeta basic gray, the large flower is a prima, and the small orange felt flower is SU's, as are the orange brads. The sentiment was stamped, cut and embossed with a tag die. I took a stipple brush and stippled pumpkin pie ink over the sentiment while it was still in the die. It looked too white, and this softenend it a bit. The main image and sentiment are on dimensionals. 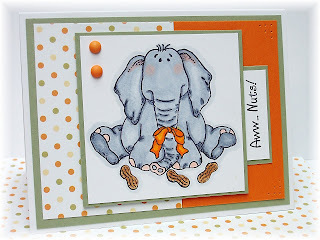 The peanuts at Ellie's feet is actually one stamp that I stamped three times. That's it! Thanks for stopping by, and enjoy your Sunday! Before I share my card with you, I want to wish everyone a Happy Valentine's Day! I hope you all have a very nice day with whomever you share it with! I was looking through my pictures saved on my computer one day and found this one and just had to share it with you! This is what my hubby created for me on Valentine's Day in 2001! (In case you can't tell, the heart and arrow are spaghetti filled with sauce!) I just thought this was the cutest thing he's ever done! He's not one to buy flowers or candy, but he does goofy things like this! Isn't that a hoot? Well, I just had to share that today. We are going out to dinner with his sister and her hubby tonight, so I won't be getting any creative dishes like this one! Have a nice Valentine's Day and please read on for today's card. 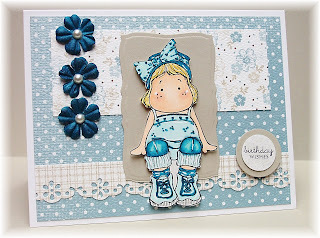 Did you see the inspiration challenge on SCS today? The inspiration are bras from a website called Artfull Bras! Quilters from South Carolina wanted to "make the public aware of breast cancer, to memorialize those lost to the disease, and to honor survivors." Well, these ladies must also have a sense of humor, because these bras they created are quite humorous! You really need to check out all 49 of them! The one I chose is Rhinestone Cowgirl. I knew I had a bunch of SU's retired Outlaw paper and a bra stamp, so I took it from there and this is what I came up with. 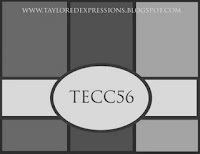 My layout is from Taylored Expressions Cupcake Challenge #55. I used three different patterns from the Outlaw pack and mounted them on a Sage Shadow base. I stamped the bra image from Gina K's Thanks for Your Support set in Adirondack Espresso and colored it with copic markers. It was cut and embossed with a circle nestie and mounted on really rust and chocolate chip scalloped circles. I placed bling on the dots of the bra and a rectangluar bling on middle part. 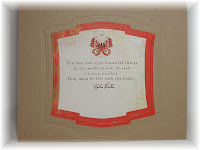 The sentiment is from this set also, and it was stamped in Espresso and cut and embossed with a tag die. The little star bling was placed over the holes. The chocolate ribbon is SU's twill and I tied three pieces of twine around it. In the inspiration piece, the straps and trim were done in rope, so this sort of mimics that. Well, I had fun looking at all those crazy bras and making this one. I hope you have a great weekend. I am off for winter break this week (insert a loud YEAH right here! ), so you'll be seeing more posts this week! Have a great weekend and Happy President's Day! Have you been seeing all the buttons lately? PTI is introducing them as a new product line, and that's all I've been seeing! I just got these Latte buttons from SU today and wasn't intending on using them, but it went perfectly with this card! My SIL had knee surgery yesterday and I needed to make a card. I had forgotten that this Quilter's Sampler from PTI had this sentiment, spool of thread and needle in it! When I saw it, I knew those buttons would work in beautifully! This card started with two challenges: the sketch challenge on SCS and the Color Throwdown challenge of regal rose, chocolate chip, and kiwi kiss. Love that combo! (As I was linking this, I read how Danielle came up with these colors: regal rose for roses, chocolate chip for chocolate, and kiwi kiss for kisses.) This is perfect for a Valentine, but I needed a get well card and it still works for that! When I do a color challenge, I take scraps of the colors I'm going to work with then proceed to my pattern paper. I find ones with those colors and then start paring them up. I found this gorgeous kiwi kiss piece in SU's new Raspberry Tart and the chocolate swiss dot piece in Bella Rose. They looked great together, so it was on to the other layers. 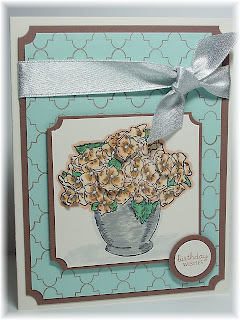 I used the regal rose and PTI white and cut and embossed them with the curved rectangle dies. I stamped my image in close to cocoa and colored it with copic markers. The needle was stamped in Versamark and embossed with silver ep. Looks just like a real needle! I put the piece back into the die and sponged the rose ink around it because it was too white. The sentiment was stamped on the rose piece in Adrondack Espresso. The rose piece and the dp were sponged around the edges with close to cocoa. I had to run out in the middle of making this card for an appointment, so I stopped at JoAnn's to get some embroidery floss (of course in rose, kiwi, and chocolate!) so I could thread my buttons! I just used the rose and kiwi colors on this card. I didn't get too fancy on the inside. I just cut and embossed a rose piece and sponged the edges. The sentiment is from SU's retired Quick Thinking and I stamped the needle and just the thread. This layout was so easy to work with! I hope my SIL likes it! Thanks for stopping by! I Got My Mojo Workin'!